ESGR Group: (From the left) Ronney Lloyd, ESGR regional coordinator, Southeast; Beresford Edwards, V.I. chairman; Stanley Jones, vice-chairman; Zandra Petersen, ombudsman director; Paul Radix, employer outreach coordinator; Lorelie Clarke, training director; Kenny Walcott, military outreach director; Hollis McIntosh, area chair — St. Croix; Eric Clements, employer outreach director; Shereen Grouby, public affairs director; Verna Walcott , volunteer support technician; and Garry Green, military outreach coordinator, attended the VI ESGR’s annual St. Croix Employer and Volunteer Awards and Recognition Dinner held June 23. Military employers and volunteers were recognized during the Virgin Islands Committee of the Employer Support of the Guard and Reserve (ESGR) annual St. Croix Employer and Volunteer Awards and Recognition Dinner held at The Buccaneer, June 23. This year, the committee presented 12 awards to individuals and public and private businesses who touched the lives of guardsmen or assisted in the advancement of ESGR’s mission. Brig. Gen. Deborah Howell, the adjutant general of the Virgin Islands National Guard (VING) talked about the importance of employers. 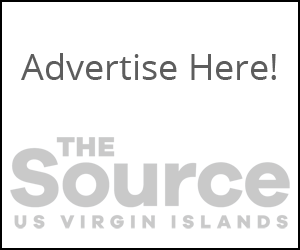 “As I review the national military strategy and formulate the way ahead for the Virgin Islands National Guard, it is crucial that we engage employer support to the Guard and Reserve as a reality. No longer just a rhetoric,” she said. Guest speaker, Wilma A. Lewis, chief judge, District Court of the Virgin Islands, thanked employers, volunteers and VI ESGR for the support given to service members. 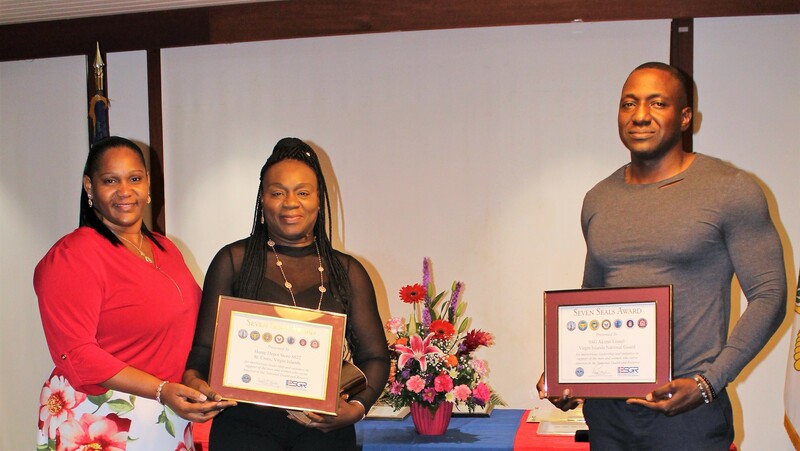 Freedom Award: (From the left) Clifford Joseph, fire service director; Dr. Michelle Davis, commissioner of health; and Michael Jaffurs, Pinnacle LLC HR recruitment specialist, are the Virgin Islands nominees for the 2018 Secretary of Defense Employer Support Freedom Award at the annual St. Croix Employer and Volunteer Awards and Recognition Dinner held June 23, 2018. VI Department of Health and Pinnacle LLC were semi-finalist for the award. “We simply do not say thank you often enough. 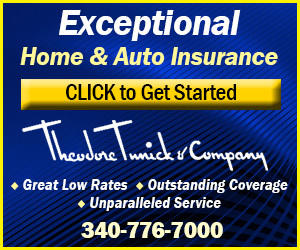 But we have that opportunity tonight,” said Lewis. 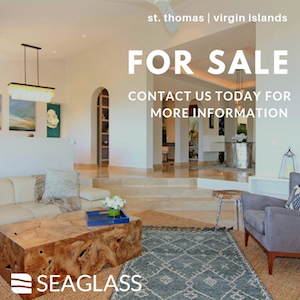 We have the opportunity to say thank you to Diageo USVI, the VI Public Employees Relation Board, Pinnacle Services LLC, the V.I. Department of Health, the V.I. Department of Education, the V.I. Fire Service, the V.I. Department of Planning and Natural Resources, and Home Depot Store 8622. We can say thank you to all of them for their exemplary support to the National Guard and Reserve service members who are their employees. That is something to celebrate,” she said. “We have the opportunity as well to thank volunteers who work tirelessly to improve relationships between servicemembers and their employers. And that, too, is something to celebrate. 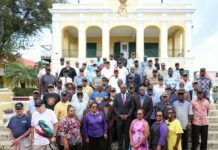 I commend the Virgin Islands committee for Employer Support of the Guard and Reserve for providing, in such grand style, this wonderful opportunity both to say thank you, and to celebrate and salute these entities and individuals for their acts of selfless service,” said Lewis. Those recognized received a wide range of awards. 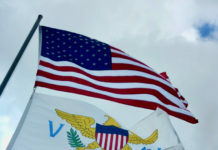 Awards presented included the Patriot, Seven Seals and Pro Patria awards as well as certificates for Virgin Islands nominees and semifinalists of the Secretary of Defense Employer Support Freedom Award. The Patriot Award presentation was conducted for Capt. Wanda Williams, VING, force integration and readiness officer, operations branch in the G-3 division. Sgt. Jevon Williams, a member of the 661st Military Police Detachment nominated Capt. Williams for her outstanding leadership and mentoring. 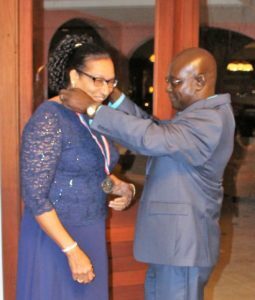 Roche Medal Petersen Award Medal 2018: Beresford Edwards, state chairman, VI ESGR, presents Zandra Petersen, ombudsman director of VI ESGR, with the 2018 James M. Roche Spirit of Volunteerism Award medal, for the Southeast region, June 23. The Seven Seals award, the broadest and most inclusive award given by ESGR on the state and national level, was presented to a business and three individuals. Awardees were Home Depot Store 8622, Seanise Jeffers, Staff Sgt. Akimo Lionel and Lt. Col. Geraldine Vaval. Home Depot was honored for their stellar support to the military community. Jennifer Johannes-Bass, store manager, accepted the award. Jeffers provided musical entertainment for several years at dinners on St. Croix; Vaval conducted several military briefings during ‘Briefing with the Boss’ events; Lionel has been the artist behind many of the invitations and programs that were created for the committee’s events. He also designed the VI ESGR banners that hang in the airports. The committee’s most distinguished local award, the Pro Patria Award, was presented to Diageo USVI. Diageo appreciates its military employees and demonstrated its commitment to support its National Guard and Reserve member employees after Hurricane Maria. 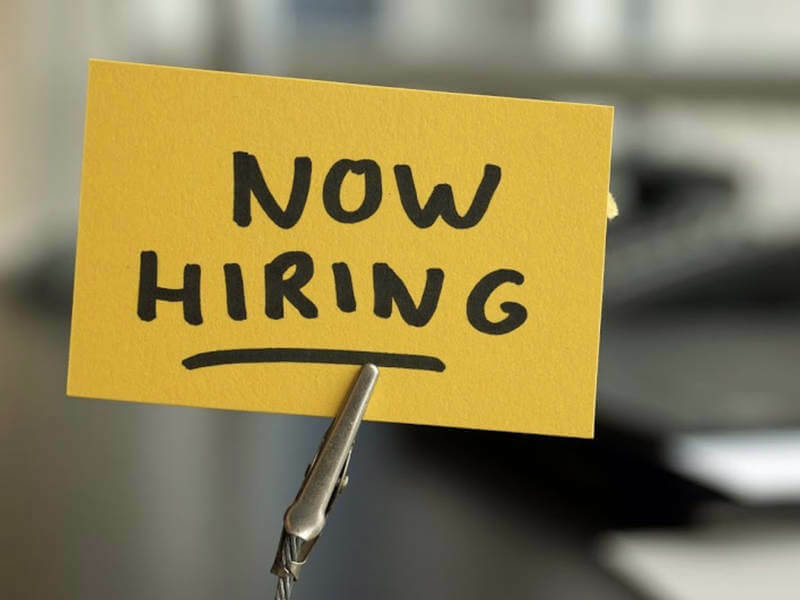 The company’s pay policy is above USERRA guidelines; it paid it guard member employees military leave after Hurricane Maria. Brenda Benjamin, logistics and procurement manager, accepted the award. 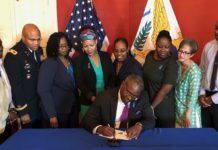 This year, six Virgin Islands employers were nominated for the 2018 Secretary of Defense Employer Support Freedom Award: Virgin Islands Fire Service, Virgin Islands Department of Health, Pinnacle Services LLC, Diageo USVI, Virgin Islands Department of Education, and the Division of Planning and Natural Resources. Presentations to the St. Croix nominees and semi-finalists for the annual Freedom Award was one of the highlights of the evening. 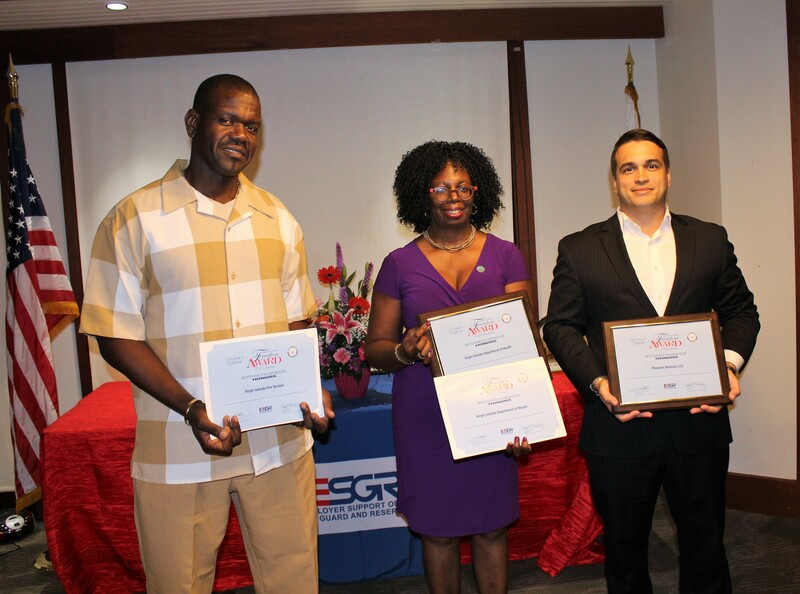 The St. Croix semi-finalists were the Virgin Islands Department of Health, Pinnacle Services LLC, and Diageo USVI. Each thanked VING for the support they have received. Pinnacle LLC representative, Michael Jaffurs, HR recruitment specialist, thanked guard member employees and has enjoyed working with them. Volunteers also received recognition for their service and dedication to the committee. 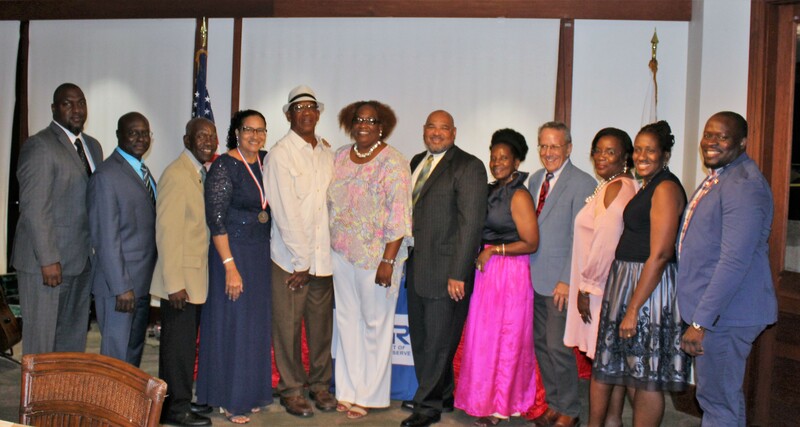 Chairman Edwards was privileged to announce the first Virgin Islands state committee volunteer to receive the highest award given by the Employer Support of the Guard and Reserve. Zandra Petersen, ombudsman director for the VI ESGR, received the James M. Roche Spirit of Volunteerism Award. Every year an ESGR volunteer is named for each of its four regions, Petersen is the 2018 Roche Award recipient for the Southeast region. 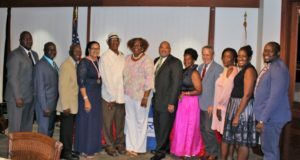 Other committee members recognized include: 2017 Regional Public Affairs Volunteer of the Year and Spirit of Volunteerism recipient, Shereen Grouby; Seven Seals awardees, Beresford Edwards, Stanley Jones, Hollis McIntosh, Zandra Petersen, Lorelie Clarke, Kenny Walcott and Verna Walcott; Outstanding Performance awardee, Eric Clements; and Certificate of Appreciation recipients, Garry Green, Marion Petersen and Paul Radix. St. Thomas employers and supporters were honored during a similar event on July 14.